Straya (that’s ‘Australia’ to most of the English speaking world …) Day is just around the corner and here in Adelaide we’re looking at a cracking long weekend, with temperatures in the mid to high 20s. Perfect for … BBQ. I found this chicken skewer/kebab recipe relatively recently and as sambal oelek is one of my all time favourite condiments I had to try it out promptly. We had ourselves all planned to BBQ this and then … the heavens opened. And while Andy would have been (mostly) dry while doing the cooking, the hot plate itself was so wet that Andy doubted he’d even get things hot enough to dry it out, let alone cook on it. And no one wants a wet kebab. Thank goodness for grills! Even though it was really a bit hot in the house to be turning on the grill, we had no option. There was no incentive to start messing around with skewers – we just cooked the chunks of meat and off we went! You don’t need to be too fussy over quantities and we didn’t bother following the original recipe’s instructions about boiling up left over marinade and so on. If you are doing BBQ food you want bang for buck, not lots of messing around! This, along with the Xinjiang lamb skewers, is definitely going to be on our BBQ go-to list! Chop the chicken thigh fillets into skewer size chunks. 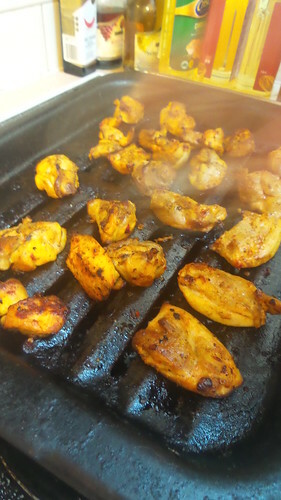 Mix all the other ingredients together and marinate the chicken for at least an hour - overnight is always best. Thread chicken on to skewers and cook on a hot BBQ (or grill). Serve with salad.